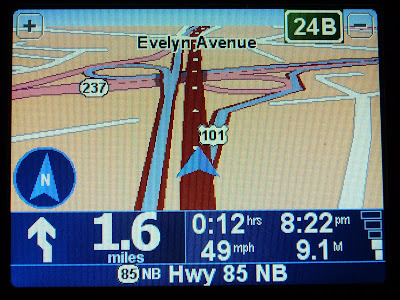 As probably any other technology junkie out there, I had been looking at the evolution of car navigation systems and thinking about how cool it would be to have a device that could really make it easy to travel in a unknown area without having to worry about studying maps ahead of time or having another person filling out the role of a navigator. A friend of mine bought a TomTom One recently and was telling me how great this device was. Not that he's untrustworthy person, but for some reason I accepted the information but didn't decide to take any further action. On our last trip to Yosemite, I didn't pay attention to the direction I was driving for a moment and forgot to take a turn that I should have. This little mistake cost us 1 hour delay, wasted gas and created some frustration. At that point I revisited the information from my trustworthy friend and started looking for a GPS car navigation system that was affordable, yet feature rich and reliable. Consumer Reports made it clear that TomTom One is the way to go. Other reviews as well as information from my trustworthy friend confirmed this. Last week, my TomTom unit arrived, after I ordered it on the Internet. It looks good, is compact, and is very easy to use. In the following days I started to get to know it during my daily commute. It wasn't until last Thursday, that I had to put my TomTom into a real-world test. The main project that I work on right now at Sun is customization and deployment of Confluence for soon to be launched wikis.sun.com. Atlassian, the company behind Conluence, organized Atlassian User Group meeting in Stanford, that I was joining. Well it really was. I left from Menlo Park campus much later than I originally planned to, so I quickly jumped into my car, input the destination address and headed out into the unknown. TomTom picked a route that most likely I would have picked as well if I studied the maps or used Google Maps*. The fact that I didn't need to watch out for turns and making sure that I was on the right street made the whole "rush" much easier. One thing that I observed during the first ride with TomTom was that the 3D maps that TomTom uses by default are really good. At first it seemed unnatural for me to use 3D maps instead of birds eye's view 2D maps. But after driving with the 2D maps on I quickly switched to the 3D view. It really is much easier to keep track of where you are and where you need to go on the 3D map! There was one point during my travel to the meeting, when I truly appreciated having my TomTom. When I was already in the Stanford University campus, navigating through a maze of little streets, my TomTom said "Turn right", I tried, really tried - but the sign "Road construction. Road Closed" didn't let me go through. I had to take the only possible turn that there was and ignore the instructions. If I had just a small scrap of paper with driving instructions on it, I would have been lost. With TomTom there is no need for panic, I just took the only turn that I could, TomTom realized that something went wrong and recalculated the route taking into consideration my current position, successfully navigating me around the road construction. I got to my destination on time and it wouldn't have been like that if it weren't for my TomTom One. Redo the TomTom Home application - currently I found almost no value in this app - it's just shopping desktop application that happens to be able to backup your TomTom. Did I mention that it crashed on me at least 5 times on my Mac during the few minutes that I used it so far?!? All in all the app is next to useless. Features like creating an itinerary, reviewing past trips, showing some statistics are lacking. 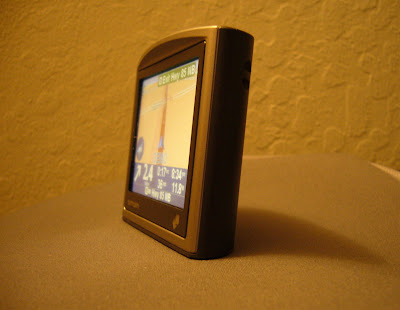 Rama brought up a good point while we were talking about the device - there is no way to tell your current elevation. Isn't that like the most basic feature of a GPS device? The device seems to be a closed platform - software-wise as well as hardware-wise. I wish it was possible to write plugins that would make it possible to add some of the features that I miss. I haven't found any "developer" section on the tomtom.com website. If it was possible to connect the device with something else than bluetooth cellphones, it would be interesting to see what could one do with a combination of a TomTom and a SunSPOT - temperature, atmospheric pressure, humidity and acceleration readings, anyone? How about switching TomTom to the night mode when it gets dark outside? How many other possibilities would opening the platform enable? See also: TomTom One Caught Speeding! * btw have you heard of the new real-time route adjustment feature? It would be really great if it was this easy to adjust the route in TomTom. Bought mine 05/22/07 and it never worked right. Now I have to return it and wait for them to decide if they want to repair it or what. 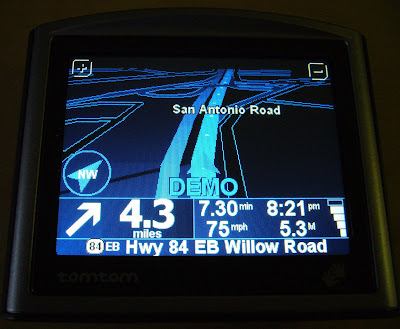 It never was recognized by TomTom Home software, but I let them string me along, promising new software (shame on me). Now it's completely died and they want it back before they decide to repair or replace. What junk! Maybe a bad piece? So far I haven't had any major problems with mine. I had many problems with my Apple MacBook Pro, I think that it is a great laptop, but *the piece* I had was a piece of junk. I purchased a Go 910 in January 2007 and it is wonderful when it works. The problem is that you never know when it is not going to work. My job requires driving all over the state of Mass, frequently at night, and not necessarily on highways. I have come out of an evening meeting at 10:00 at night and found a dead TomTom. I now always carry a strong flashlight, a paperclip that I can straighten out and a magnifying glass (no, I am NOT kidding) so I can reset the TomTom after recharging the battery by running my car (but not for the required two hours). But last week this did not work and I have been unable to restart the TomTom and still have not had an answer back from Technical Support on the ultimate solution . A great little machine but I will not be buying another TomTom unless someone tells me that this is a common problem for all GPS systems. It's definitely not a common problem. I haven't experienced it with mine TT One. I hope you'll get an answer from TomTom that will resolve your issues. I've bought 3 tomtom's today, ALL OF THEM WERE DEFECTIVE! The model 330 the power connector came apart inside of the unit, the model 130 the screen kept doing wierd things and it would only "sometimes" speak the directions, and the model 125 the power button would not work! So I drove over to another store to look at GPS devices, and I asked a tech guy why TomTom is junk, and explained my situation, he said TomTom has the highest return rate of any GPS product in their store, and advised me if I wanted a reliable product to steer clear of them, wish I would have told to him before wasting 6 hours of my time on 3 defective TomTom's in a row, wow I hate that company! When I went to visit Stanford uni, tomtom told us to take a right and a left, so we ended up in the middle of the campus. So we drove the same road back, but were trapped by a raised telescopic pole. Luckily another bus came by that lowered the pole. I have been using GPS for 5 years and consider myself highly experiencd with the item. All I have used during the 5 years was Garmin's and never had 1 problem. But, the annual map updates can get expensive after a couple years. So I bought a TomTom XLL 540 TM that has lifetime updates for both traffic and maps. So far the unit has performed okay with no problems. The area of concern is the $19 subscription for fuel updates. I update the fuel info each day and each day the TomTom fuel prices fall farther behind real-world prices. Today, the TomTom is reporting fuel price 40 cents lower than current prices. And they continue to give me daily updates of the wrong info. It is possible to go to www.gasbuddy.com and get actual fuel prices for free. I'm coming to believe that the TomTom company is a true Mickey Mouse operation with an inability to correct its own problems. Has anyone else had this same problem. We live in WS9 9DF and no TomTom has picked it up correctly. Any Google map finds it straight away, So why cant Tom Tom get it right even after so many years.